You are here: Home / All blog posts / Now THIS is more like it! I spent all day yesterday visiting with fiber artists: first a three-hour drive to Ukiah for lunch with Holly Brackmann, then a two-hour drive to Napa to the Silverado Weavers Guild, where I was giving the evening program.Â I didn’t get home until well past bedtime, but I thoroughly enjoyed every moment of visiting both Holly and the Napa guild.Â Holly had some amazing devore samples that she showed me, and also showed me some wonderful textiles from her world travels – it was fun chatting with her and I’d love to see her again.Â My presentation at the Silverado Weavers guild seemed to be well-received (it was about the creative process), and it was lovely meeting up with several people I’d been corresponding with.Â My one regret was that I didn’t get to see Barbara Stafford’s rugs.Â However, Mike and I are going back to Napa for our anniversary – yes, we are coming up on our first anniversary! doesn’t time fly? – so perhaps we can stop in then. Anyway, back to weaving: I finally got the warp threaded, sleyed, and tied on.Â I wove a few inches with a solid colored weft, and didn’t really like the feel of it.Â So I dyed my two knitted blanks, dotting on the colors so the yarn would come out randomly variegated.Â And….ta daa! I love this.Â (Click for the larger version.Â It’s worth it! 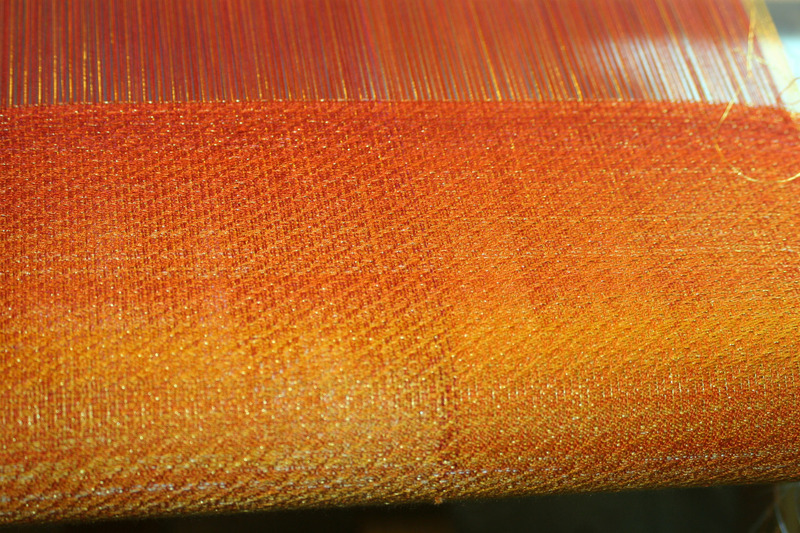 )Â The variegation in the warp and the weft produce beautifully complex color play, while the weave structure adds texture both to the physical fabric and the color.Â It is even prettier in person! – the glitter of the gold doesn’t show in the photo.Â I am loving every moment of weaving up this sample and can’t wait to see how the rest of it comes out.Â The warp is progressing into maroons and purples, and will eventuallyÂ get to brown; the wefts have a similar color progression, but in different shades. Off to bed!Â The sooner to bed, the sooner I can get up again and start weaving! The picture is gorgeous–can’t imagine how much prettier it must be in person!